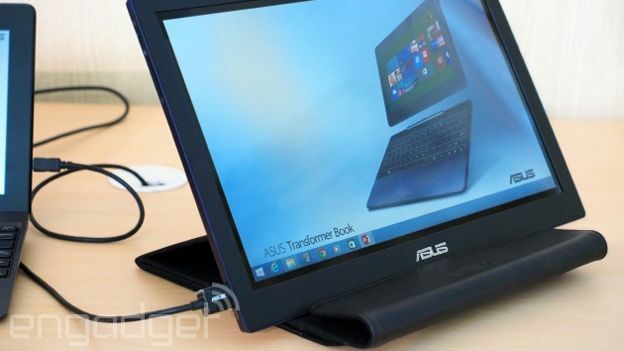 Asus has unveiled a 14-inch touchscreen USB monitor at Computex. Yeah, yeah. We know. USB monitors are pretty much useless for anything involving moving images, but Asus' latest version comes with a touchscreen – and that's a big deal. Why? Well, because the addition of touchscreen means that these monitors can now be hooked up to tablets. The touchscreen can connect to any device that has a USB 3.0 port and has support for up to ten fingers. While it's not going to blow your Galaxy Tab Pro out of the water, it does mean that buying a smaller tablet doesn't mean being locked into a tiny screen. The resolution isn't great though. The version Asus has on display at Computex only has a resolution of 1,366 x 768, but that should be enough to give those wanting a bigger screen for short periods of time other options than replacing their tablet. It's currently only a prototype, so there's no price or launch date but we'll, ahem, monitor the situation.